With the hustle and bustle of Egypt’s heavily packed streets, a simple errand that’d ideally take ten minutes can easily turn into an hour-long traffic nightmare with deafening car horns all around you, making you wish you owned a slim little Vespa to weave in and out of traffic with ease. 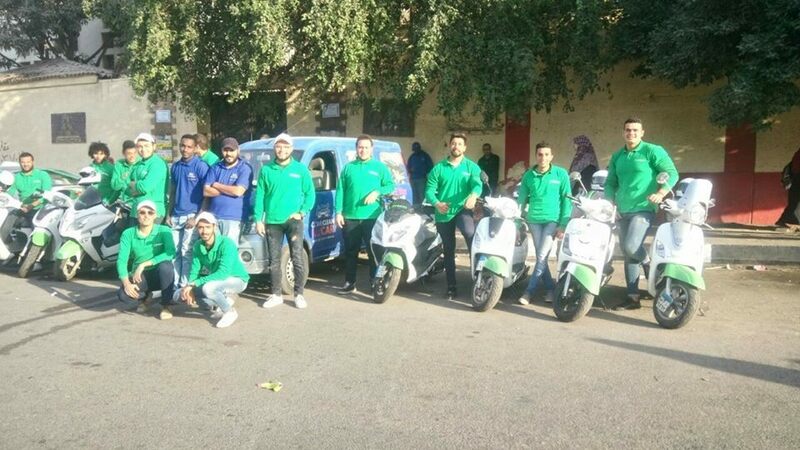 Aiming to help commuters reach their destination in the fastest and most affordable way, ride-hailing app Careem recently announced the integration of scooters and motorcycles into their service fleet in Cairo, Alexandria, and Tanta. However, Egyptians who spoke to Egypt Independent are not all that convinced about the new bike service, pointing to road safety and sexual harassment as potential problems. “I won’t feel comfortable on motorcycles, they’re much more dangerous than cars, especially if we’re talking about the chaotic streets of Cairo,” 24 year old Omar Abdel Sattar said. “The idea is good because it’s efficient and much cheaper,” he said, adding that he runs many errands around Heliopolis and would primarily hope to save money and gas. However his safety still remains his priority, which would make him prefer a car over a scooter. Since its launch in Egypt in 2014, Careem’s operations across Egypt have been customized to suit the specific needs and demographics of every city. However, transportation can still be a real challenge for commuters. By introducing the new bike service, Careem offers its customers a more time-efficient, affordable and fun means of transportation. “A trip that costs EGP 30-35 in a car would only cost around EGP 5 on a Careem bike,” Rana Ghanem, Careem’s PR manager in Egypt told Egypt Independent. “It’s specifically catered for short distance commutes around Egypt’s neighborhoods; we wanted to facilitate transports across our vibrant and crowded areas. We believe it can be a very successful alternative,” Ghanem said. Gaser El-Zahaby, 21, shares Abdel Sattar’s sentiments, further adding that upper middle and higher class riders would pay that extra EGP 30 for a car in order to ensure their safety, and comfort throughout the ride. Ghanem, however, told Egypt Independent that the service is targeting riders who are up for “a new exciting experience,” and are looking for others modes of transportation that also are cheaper. “All captains enrolled by Careem go through heavy road trainings and drug tests. Bike Captains get extra safety training for speed, as well as conduct,” Ghanem said. Four women interviewed by Egypt Independent said they would not consider Careem’s new bike service. “Are you kidding me? We get harassed in cars and are usually somewhat anxious that we ride with a stranger, I can’t imagine what it can be like hopping behind a strange man on a scooter,” Naira Sherif, said. “I would have considered it if the captain was a women, I might even tell her I want to drive it myself,” Shimaa Ali said sarcastically. Yomna Ahmed pointed fingers at Egypt’s culture and traditions that would condemn a girl’s behavior if she’d go for the ride. “I think Egypt’s environment is not that open minded,” she said. Careem’s innovative new solution that kicked off in Cairo this November will alleviate traveling costs by 35 percent compared to the regular ride. The current number of Careem scooter captains reached over 1,000 with a 55 percent growth rate every week. The fleet gets quadrupled every month, according to the company statement.